Anthony Davis still wants out of New Orleans. In case there was any doubt the Pelicans center had thoughts otherwise, he delivered a clear message with his T-shirt as he arrived for New Orleans’ final home game of the season against the Golden State Warriors on Tuesday. “That’s all folks!” his shirt read in an homage to Porky Pig and his desire to leave town. Davis’ camp demanded a trade from the Pelicans before the NBA’s in-season trade deadline. When a deal with the Los Angeles Lakers didn’t pan out, the focus on a Davis deal shifted to the approaching offseason. Davis has played sparingly since the deadline and hasn’t dressed for the Pelicans’ last six games. He won’t suit up for the Warriors game either. 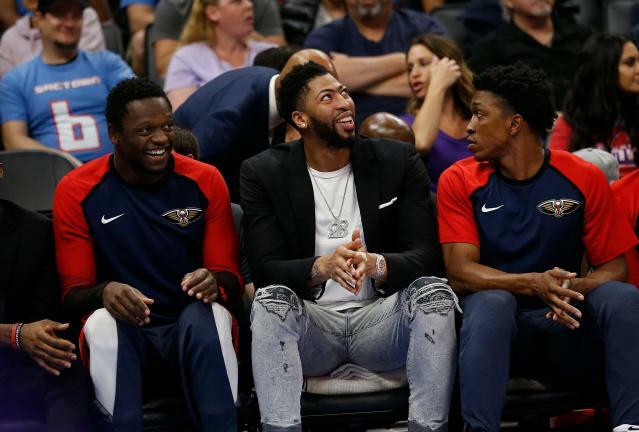 Davis has one year remaining on his contract, and the Pelicans are expected to court interest from multiple teams during the offseason, with the Boston Celtics expected to join the Lakers at the front of the line in a bidding war for his services. Davis, 26, is a three-time All-NBA selection and has made six consecutive All-Star games. The Pelicans struggled to build around Davis after drafting him first overall in 2012 and never advanced past the second round of the playoffs.